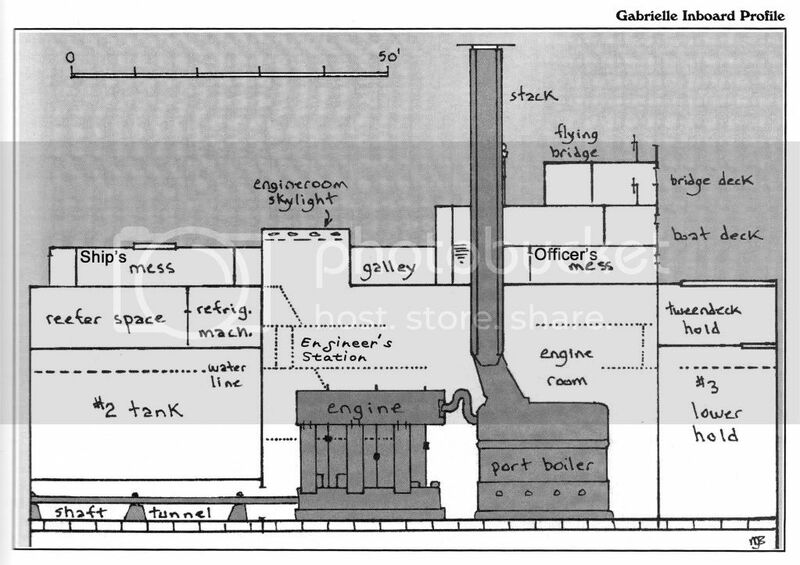 The SS Gabrielle is a 7500-ton steamship built for travel in Arctic waters. She was launched from Scotland in 1913, and served her first decade in the waters of the North Atlantic. Her hull is composed of Swedish wrought iron an inch and a quarter thick. She is not an icebreaker though, and safe travel in the Antarctic seas is dependent on timing and weather. 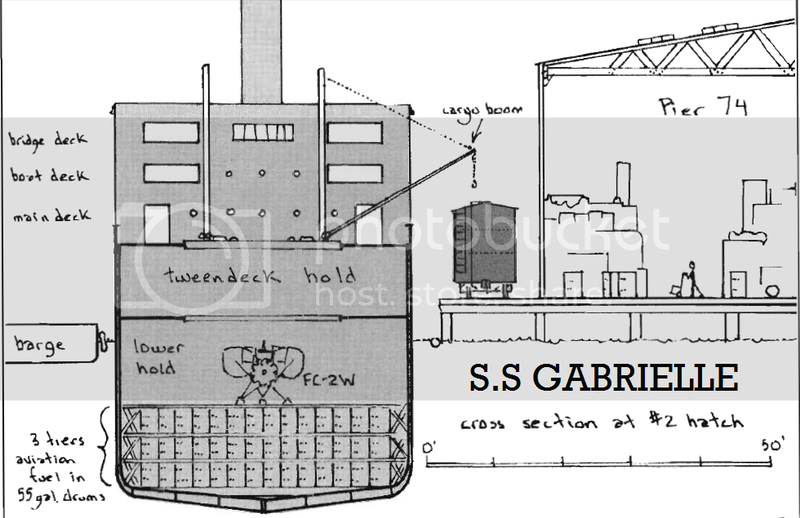 The Gabrielle has been leased to the Starkweather-Moore Expediiton to the Antarctic for the duration of the endeavor, at a cost of roughly $2000 per day. Gabrielle has five decks, used by passengers and crew. 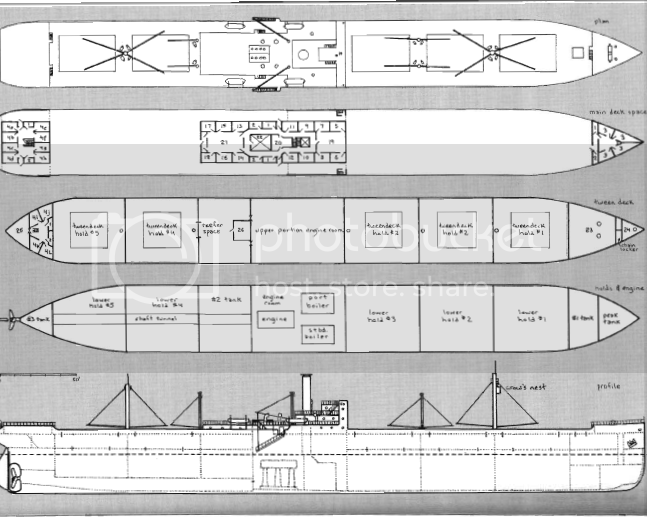 From top down, these are the bridge deck, the boat deck, the main deck, the tween deck, and the engine (or cargo) deck. Passengers and crew aboard the Gabrielle, when they are not on deck, will spend most of their time in one of three living areas: the forecastle, the aftercastle, and the super-structure. These are described below. The forecastle is a small cluster of cabins on the main deck in the far forward portion of the ship, just behind the bow. Normally these cabins are used only by the crew, generally the ship's regular seamen and quartermasters. The cabins in the afrercastle are normally reserved for the engineering crewmen and any ship's specialists, such as carpenters, who bunk aboard. These take up space on both the main and tween decks at the far sternward portion of the ship, directly above the ship's propellers. The captain, the ship's officers, and any passengers normally sleep in the superstructure three decks tall, that rises off of the main deck amidships. The superstructure is directly above the ship's engines. The ship's bridge is on the highest deck, and looks forward toward the ship's bow. 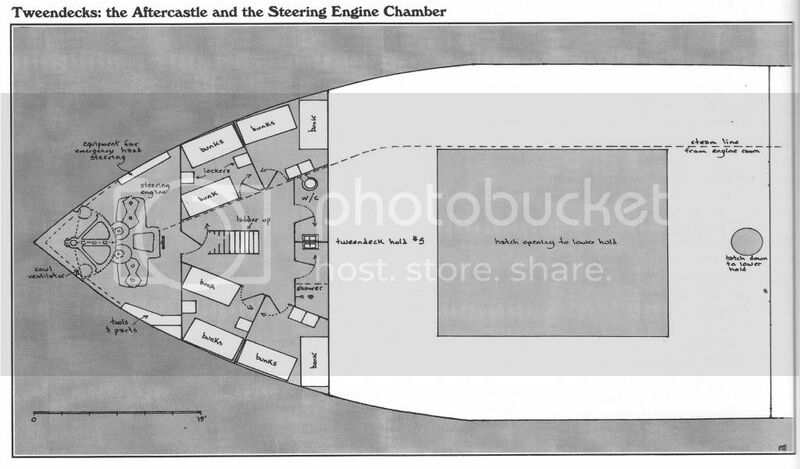 Cabins in the forecastle and aftercastle are spare and cramped, and have no windows or portholes. Most cabins have multiple occupants who sleep in narrow bunk beds. Cabin doors have slitted vents, but there are no other conduits or means of circulating air or cooling the rooms. When needed, heating of all cabins is accomplished by means of steam radiators bolted securely to the floor or wall. The remainder of the ship is given over to cargo holds. There are five of these, numbered 1 to 5 from the bow to the stem. Holds 1,2, and 3 are forward of the bridge, while 4 and 5 are toward the stem. A large refrigerated compartment (the "reefer hold") lies immediately forward of hold 4, above the ship's main fuel tank. 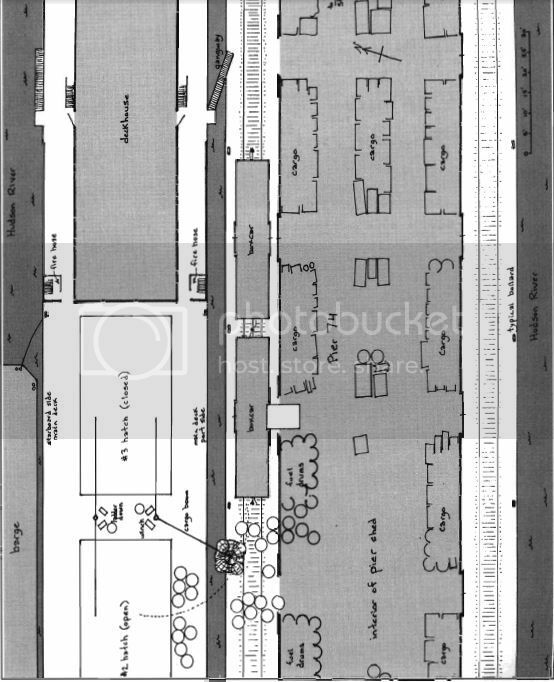 Depth, Keel to Main Deck - 11.887m. Draft, Light Ship - 3.0480m. Draft, Loaded Ship - 7.9248m. Light Ship - 4.550 tons. Loaded Ship - 13,350 tons. Crew, Stores - 40 tons. Fuel, Oil - 1,690 tons. Fresh Water - 160 tons. Number of Holds - 5 + reefer space. - Reciprocating steam engine, top speed 12 knots (22,22km/h). - Uses 0.14 tons of fuel per nautical mile at 11 knots (20,37 km/h). - Maximum cruising range is about 19312km. - Master and 4 deck officers. - Chief engineer and 4 engineer officers. - Radio operator, carpenter, boatswain, and storekeeper. - 3 quartermasters, 9 seamen. - 15 engine room crew (oiler, firemen, wipers, water tenders). - 1 chief steward, 5 other stewards (cooks, messboys, laundrymen, etc). - Line gun, 18 life rings with water lights, flares and rockets, life raft. - There are 14 CO2-charged hand fire extinguishers, mostly amidships.